Drifting is something which we all love to do. Drifting is a driving technique which a driver uses to drift the vehicle, but sometimes when we walk on a slippery floor then most of us drift on that floor just for fun. This video is also about drifting but you will not see any vehicle drifting in this video, you gonna watch something even better than Tokyo drift. 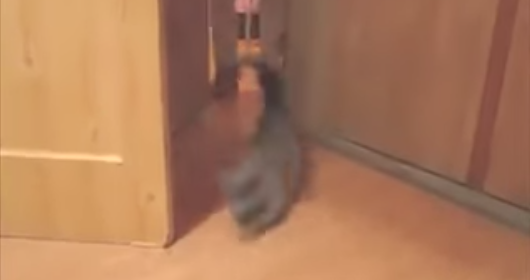 You will watch cats drifting in this compilation. Several videos of cat drifting are compiled in this video and wonderful sound effects have been used in this video, which make it 100% better. The cats are running around the house and playing with other cats, during their run the cats drift on the floor just like cars because during drifting rear wheels of the cars slip and same as when cats slide, rear legs of them slip. The cats are actually one of the active animals so these are running very fast and when they are about to turn then because of the speed cats slide on the floor. The floors are seem friction less, hence, it increases the possibility of drifting. Because of the low friction floors chances for the cats to drift on it increases, moreover cats have flexible bodies, quick reflexes and sharp retractable claws which make drifting possible. The best clip in this compilation is when a cat slides through little race track markings on the floor, the cat does not even touch single mark on the floor. The last scene is really awesome, a man released the cat and the cat runs like a bullet, something drops in the way which i could not understand, what was that. The cats, especially young kittens, are known for their love of play. Nowadays cats are common pets and their worldwide population exceeds 500 million just because of their fun loving nature. You might have seen so many car drifting videos on internet but i am sure this is the best drifting video you have ever watched. This is i think much better than Tokyo Drift and one of the best cat video ever uploaded on internet. Thanks for watching this amazing compilation and i hope you liked it and make sure to share it with your friends as well.